Originally published under the title "Ahmed Hussen, My Kind of Muslim." 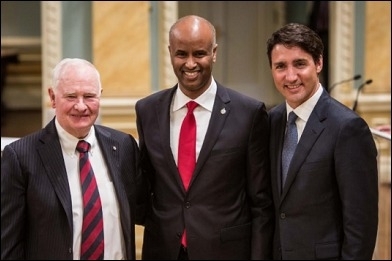 Governor General David Johnston (left) and Prime Minister Justin Trudeau (right) with Ahmed Hussen, Minister of Immigration, Refugees and Citizenship (center) on January 10. On Jan. 10, Prime Minister Justin Trudeau made a decision that made ripples throughout the world. From Singapore to India, to the BBC and beyond, the only news from Canada that made headlines was about Ahmed Hussen, a Somali-born refugee who arrived on our shores in 1993 and rose to become our Minister of Immigration, Refugees and Citizenship. For spotting talent and lifting a backbencher into the Privy Council, I tip my hat to Trudeau. Hussen first came to my attention at the height of Ontario's historic (and successful) fight rejecting the use of Sharia law in family law arbitration matters in 2004-2005. On one side was the mosque establishment and many Islamic clerics who had set up quasi courts and appointed "Qazis" to invoke Islamic Sharia in settling family disputes. Opposing them was a much smaller group of secular and liberal Muslims – including yours truly – for whom this was a do-or-die moment. We knew how the UK had let this happen many years before, only to discover, too late, the Muslim community of Britain being held hostage by Islamic clerics. Hussen says Canada must 'counter the toxic, anti-Western narrative that creates a culture of victimhood' among Muslims. At the time, Hussen was a Liberal staffer with ties to then Ontario cabinet minister George Smitherman. Along with another Muslim staffer, Hussen helped us connect with Smitherman, where we made our case to ban Sharia courts in Ontario. While Hussen supported our goals, he never crossed the line to help us more than what was appropriate, transparent, and above board. That same year, the Toronto Star listed Hussen as a "Person to Watch". People were already noticing the lanky lad from Regent Park, but I am not sure Hussen knew that at the time. When asked by the Star if he had political ambitions, the future immigration minister said, "I don't think I could handle the life of a politician . . . I don't want to be front and centre." A community organizer in Regent Park, when the Toronto District School Board (TDSB) tried to pigeonhole Canadian-born kids of Somali ancestry as "Somali kids" in 2014, Hussen led the fight against this paternalistic orientalism, denouncing attempts by the board to segregate in the name of integration. He told the Toronto District School Board: "Do you need to stigmatize and marginalize people to help them? ... In the name of 'help' you can actually do a lot of damage if you don't do it the right way." Canadians concerned about the global and Canadian rise of Islamism and jihad should be reassured they have an ally in Hussen. The strategy of Canadian officials as they confront this phenomenon in my community has been to view this serious matter only through the prism of law enforcement ... There has not been a parallel attempt to counter the toxic, anti-Western narrative that creates a culture of victimhood in the minds of members of our community. Hussen is already showing his mettle. On Monday, he told CBC News he was committed to bringing non-Muslim Yazidi refugees, victims of ISIS, to Canada, a group that has been largely excluded so far.